DTC Mobile Philippines released their newest smartphone dubbed as GT15 Fiesta, first quad core phablet of the company with mega 6.0 screen size. AS what most of mobile phone users want nowadays, a bigger screen for ease and productivity purposes which DTC Fiesta is all about. You can easily explore and enjoy every task you throw on this phone from simple apps, gaming, social networking to business usage all you can do that with GT 15. What makes it more exciting is that it also comes with a fiesta price dined in for everyone who wants to avail this smartphone. 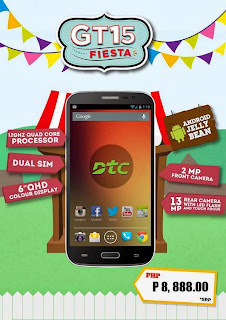 DTC Fiesta has 6 inches screen with qHD display at 960x540 resolution. One thing I miss or they missed with this phone is the scratch resistant feature (Dragon Trail Glass, Corning Gorilla Glass) that add attraction to phone buyers aside from that mega screen. I assume that GT 15 doesn't have that feature but you don't need to worry guys, there are screen protectors out there to avoid scratches on its screen. Its resolution also came up quite short for that screen but it is close to HD display so you can expect that this phone will render good viewing colors. Camera is another thing that buyers are looking for. DTC GT15 Fiesta has a 13 megapixels back shooter that may render good pictures. Another good point is that it has a LED flash and touch focus features that you can make use for your mobile photography needs. Its front camera has 2 MP that you can use for selfie and video calling apps like Skype. This phone runs on a quad core processor paired with 4GB internal storage and 1GB RAM. Though you cannot fully used it ROM storage still you can store gigs of files and data on it or you have the option to use external memory card to expand your storage space. GT15 supports up to 32GB on microSD card. It runs on Jellybean OS so you can expect fluid and fast UI than the previous version of Google OS. As what the usual Jellybean OS bundled by our local mobile manufacturer it has minimal customization but you can root and install custom ROM if there are available over the web. There are post and comments that the promo price for this phone is only 7999 pesos but DTC officially announced and posted the price for GT15 Fiesta at 8,888 pesos. Another affordable Android phablet you can watch out in our local market today. Few features that needs to be upgraded are display resolution and screen type. With regards to its price, I think DTC should lower it down to be able to compete with other local brand as there phone of the almost the same specs that is priced below 8000 pesos.